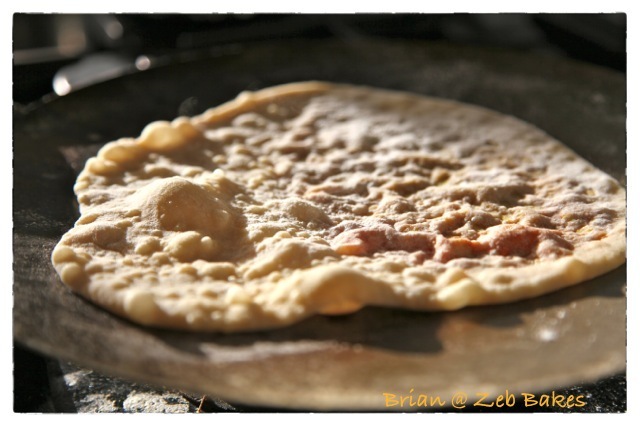 Here are some brilliant flatbreads filled with spicy dal rolled out with my magic Turkish rolling pin for Short and Tweet over this last weekend. 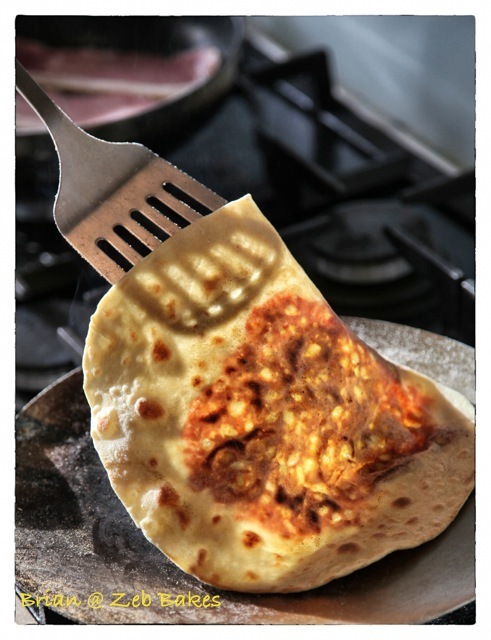 This recipe is by Dan Lepard (P.73 of Short & Sweet, Lentil Filled Flatbreads) with the help of Franka Philip. 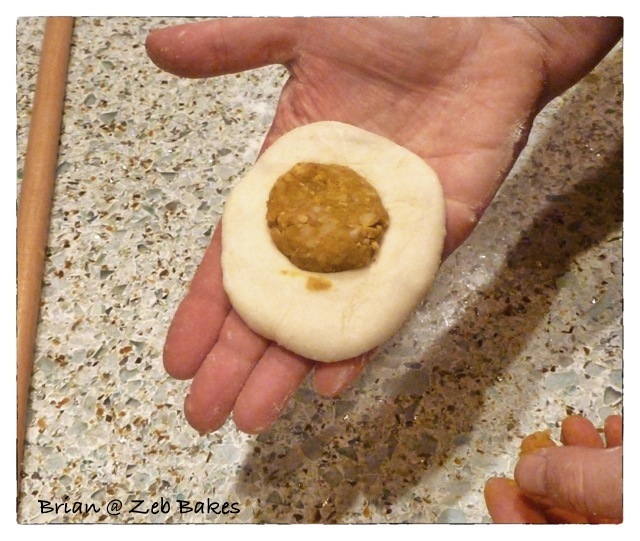 Check out Franka Philip’s photos of making these with Dan; she kindly gave us advice on Twitter on how to seal the little pockets of dough around the filling before rolling them out. Twitter is a funny place, I would never have thought I could ask a cook book writer I had never met for help directly but all the ones I have had contact with are extraordinarily kind and positive. Thank you once again Franka! This dough was really interesting in that the dough is made without yeast or sourdough and is left to age in the fridge. Pooh pooh you might say, what difference would that make? Well, the flat breads rolled out really easily after their long chill, puffed up in the pan and were incredibly tender to eat, light and just yummy. 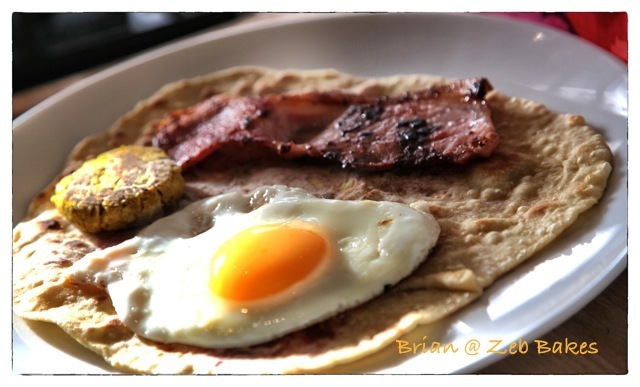 If I compare them to these quick flatbreads that I made recently these Trinidadian style roti are way superior in terms of their tenderness and flavour. I had every conceivable colour of dal in a scruffy box in the cupboard, waiting for me to make dal with, except I only had half the quantity of the red dal I needed for this recipe, so I added some uri dal in, thinking that would be OK. It was in the end, but whereas the red dal cooks fast and goes quite mushy, the uri dal stayed resolutely uncooked for ages and retained its shape, so when you look at the photos you can see the pattern the uri dal made. Still it wasn’t a disaster by any means! 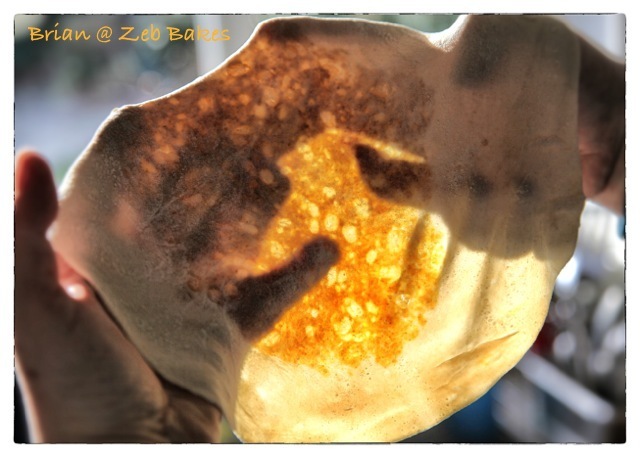 I found it quite fascinating how the spiced and garlicky filling started off dark yellow and then as it cooked again within the confines of the roti turned a wonderful rich amber-red colour. I don’t know quite why it did that, the combination of spice, salt and lentils? We used our flatbreads to scoop up a spicy pork mince dish that I made up with some ancient freezer aged mince, garlic, ginger, fresh garam marsala, a mild chilli and a tin of tomatoes (the sort of thing I made as a student, only a bit better than my cooking abilities then) and a little dark green fresh spinach on the side. All eaten before I thought to take a photo, oops. I rolled like a demon, a rather slow demon, and B flipped the breads in the pan. The recipe made loads, so we paused half way through our roti making, ate far too much and then I made the last few balls up and put them in the fridge for a further night. 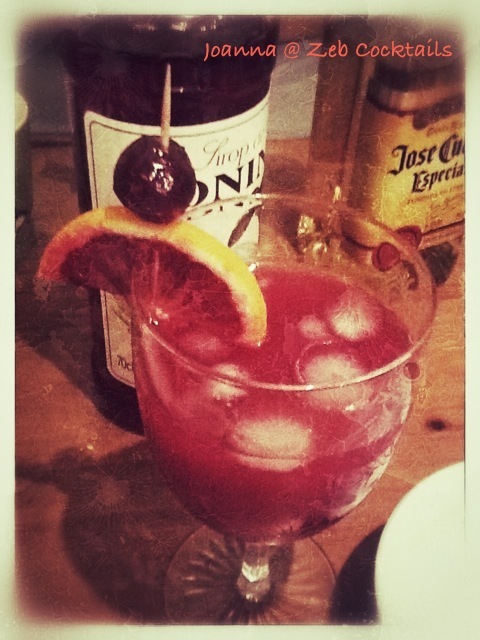 Incidentally, I also learnt that a Tequila Sunrise made with blood orange juice is called a Tequila O Positive. Dad gave me this beautiful glass when I visited him last year, he told me he bought it when he was a student so it has survived a long time. I slept well after all that hard work, concentrating on the delicate rolling out of these breads. We watched the season finale of Borgen, best thing on TV the last month, and shared a plate of atmospheric (dark and gloomy Copenhagen) lemon cardamom (no baking powder this time!) madeleines made from Thane Prince’s recipe here. Edit: Another oops, I forgot to add this picture in! Back to the tale of the Tender Ones – The following morning I pulled the remaining balls out of the fridge (36 hours after the dough was originally mixed) and rolled them out in the early morning sunshine and we had them for breakfast topped with egg and bacon and a squirt of tomato ketchup and took sunshine filled photos to share with you. I was so pleased the sun came out! 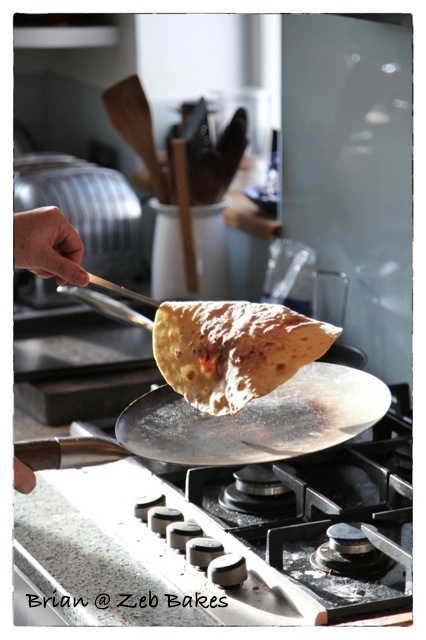 Last year we made some alloo parathas (left) with Mellow Bakers, but they weren’t a patch on these! I will definitely make today’s recipe again. 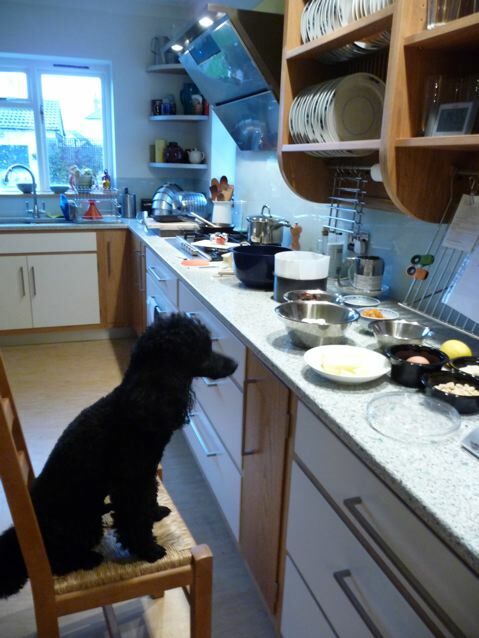 We are going to investigate making thin rolling pins from dowel as I really think it makes it much easier to roll these little quite frail balls of dough out and I would like one that is a bit shorter so I don’t hit stuff off the worktop when I am rolling. I am getting on much better with this skinny pin than I do with my big rolling pin, or else it is just practice. 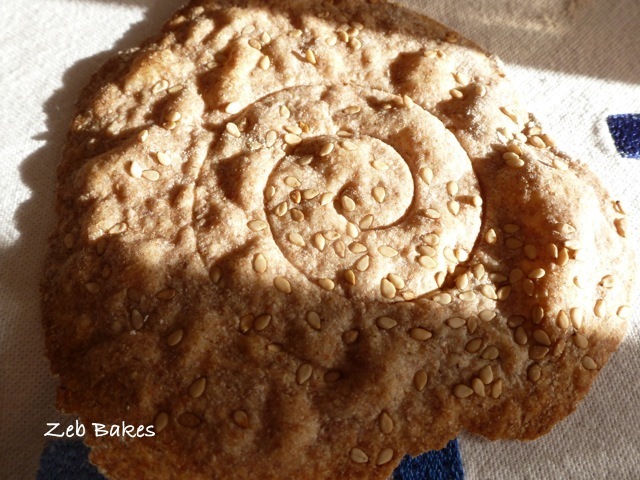 PPS Here’s Evidence Matters’s super round up post for this week’s baking. Have a peek and discover some new blogs to read and if you want to join in it’s very easy and all explained over on her blog. 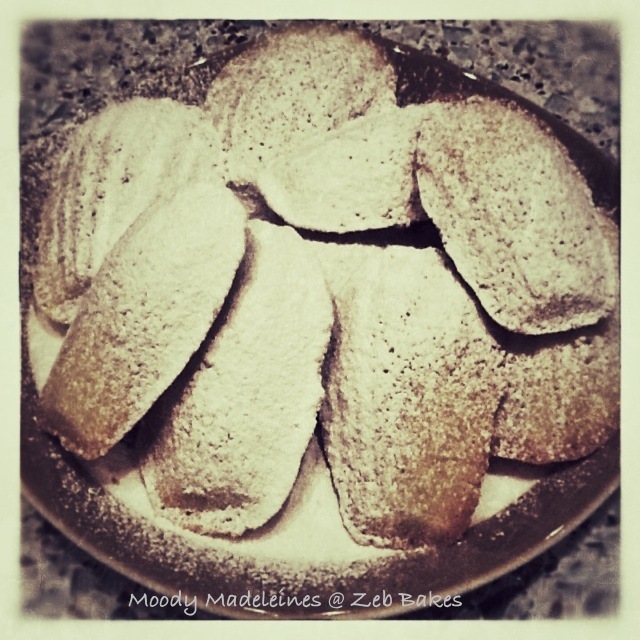 This entry was posted in Bread, Flatbread, Food, Short and Tweet and tagged baking, Bread, dal, Dan Lepard, Flatbreads, Franka Philip, Lemon cardamom madeleines, roti, shortandtweet, Tequila O Positive, Thane Prince on 06/02/2012 by Joanna. The Mellow Bakers project of baking through Jeffrey Hamelman’s great collection of recipes in Bread, A Baker’s Book of Recipes and Techniques, has come to an end. This is a sort of thinking aloud post, so I’d be interested to hear any thoughts particularly with regard to using wordpress for group baking. You may of course think there are plenty of places already to do that, but I think it is always worth experimenting with different formats, as different things suit different people. I was just having a quick read on the Mellow Bakers forum to see what they are up to and it looks as if there will be a brand new group of bakers starting working their way through Bread by Jeffrey Hamelman this year, so if you wanted to join in last time but felt it was too late to do so, have a look on that forum and see what’s going on. The principles are very simple. It’s a free to join, no strings, come and go as you please internet space, run and moderated by Paul. You can write about your baking there, you can post photos, links to your blog, ask for help, chat. Bake some, all, or none of the recipes. 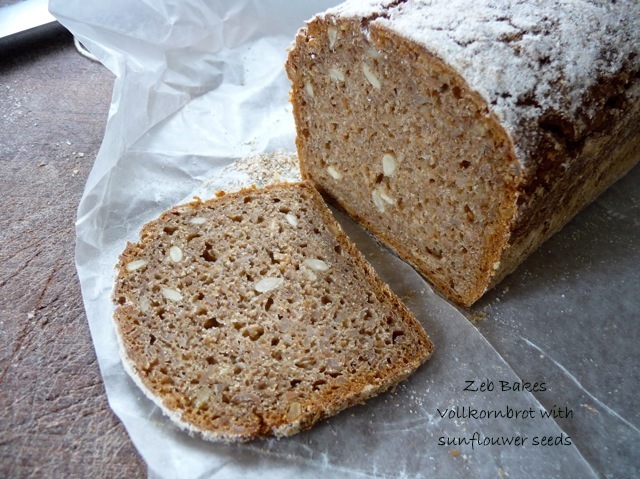 I began Zeb Bakes because I wanted a home for my bread posts while I was baking along with Paul, Abby, Andrea, Jacqueline, Ulrike, Melanie, Geraint, Doc Fugawe, Natashya, Steve to name but a few of the many fantastic people who dropped in and baked and chatted there. Some people only popped in once or twice, some people baked everything they possibly could. It has been a fairly relaxed affair and I have learnt so much while I was doing it. Thank you all of you! 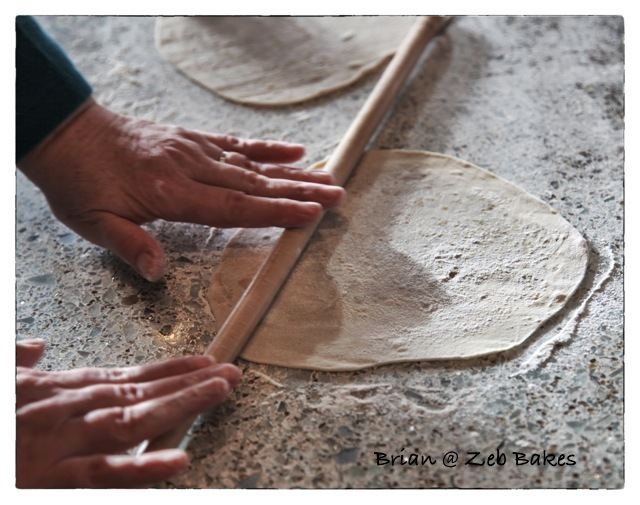 I really enjoyed baking along with some great people who dropped in and out over the course of the Hamelman project. I take my hat off to the amazing bakers who baked every single one of the recipes. I managed forty five (I think!) different bread recipes out of all the ones we could have made. You can see the ones I made by clicking on these two pages in my menu bar, here and here. There are of course other forums to join up to if you want to talk bread, there’s the Real Bread Campaign in the UK, which you have to pay to join. I was a member for one year but it seems more aimed at would be professionals than at people like me so I have let my membership lapse. There’s also the Fresh Loaf in the US, which has members from all over the world and is a very fast moving and big forum. If you speak German or Spanish these are links to two forums in those languages. Terry, who I met at Joe’s and Martin’s baking weekend in Yorkshire, runs a wood & pizza oven forum where they talk bread and pizza in particular and is well worth visiting too if you have questions about oven building. And then there are the one off Twitter bake alongs where people teach you how to make a starter, or how to make rolls like Luc Martin did recently. I made brioche one happy Sunday following the @halfdrunkduck’s great instructions. It reminded me of Dan Lepard’s Dundee Cake bake off which was one of the funniest things I have ever done on my own, Sally BR and Gill the Painter were in on that one and we have been great friends ever since – I wish we could do another one day, though I know they take a lot of organizing. Thinking along those lines, maybe we could do one using the P2 group theme on WordPress which allows for realtime updates? If anyone is interested in giving it a go, maybe one Sunday later this year, do let me know. For those of you unfamiliar with how WordPress.com (not wordpress.org which is the self hosted side of the business) works, you sign up as a user (free) and then you have a wordpress name and password and you can be added to a group blog where you can upload text and photos without having to have a blog if you don’t want one. Of course if you do want a blog, you just opt for that. WordPress don’t charge you for the basic blogs, but they do have fees if you want to keep your blog advert free, like this one, or to register your own name, and various other things, all explained on their site. I could set one up and see if we could make it work for one-off bake-alongs if there is interest. If you want me to add a link to any non commercial bread forums or upcoming low cost bread events that I have missed out, please put something in a comment below and I will edit this post. NB I’ve edited this post a bit since I first wrote it to make the bit about wordpress clearer. I have taken out all references to group baking of Dan Lepard’s books as this seems to be causing problems lately. For more on this see Paul’s recent post on Mellow Bakers and if you wish join in the discussion there. I have left people’s comments on this post as they are. 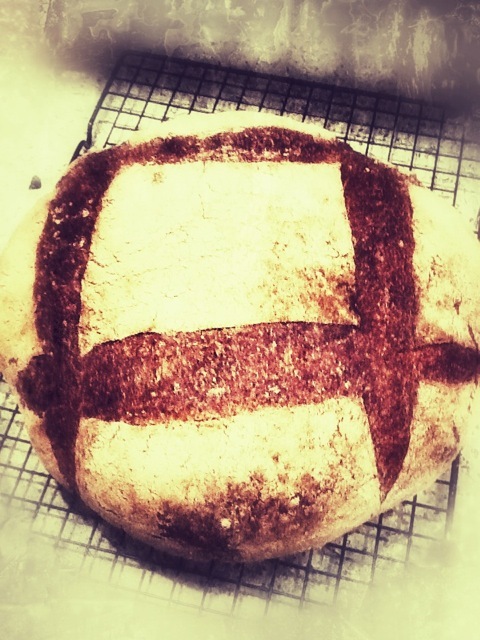 This entry was posted in Bakers, Bread, Keeping in Touch, Mellow Bakers, Short and Tweet and tagged bake alongs, baking forums, Baking with other people, Bread, fresh loaf, Mellow Bakers, Twitter on 01/02/2012 by Joanna. These are the best muffins I have ever tasted! Over the weekend I re-visited two recipes of Dan Lepard’s which I have made before on several occasions. They were being baked by the Twitter Short And Tweet group which is really gaining momentum now. This entry was posted in Bread, Buns, Short and Tweet and tagged baking, Bread, cider vinegar bread muffins, Dan Lepard, Short and Sweet, Short and Tweet on 18/01/2012 by Joanna. Sourdough Rye crisp breads – extra thin and snappy with it! The Holy Grail for me at least of rye crackers is that they should snap and be brittle, something like a potato crisp (chip in US English) rather than something you have to gnaw your way through. Stale crisp breads usually respond well to a reheat in the oven, but if they are too thick and hard then they are no fun at all. 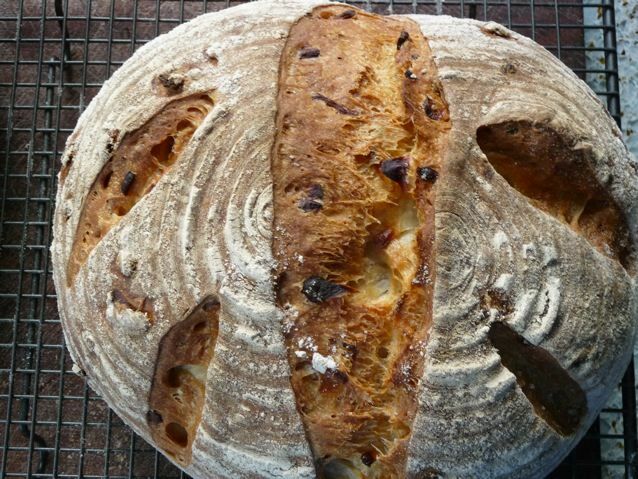 This entry was posted in Baking Kit, Bread, Short and Tweet and tagged baking, cider farls, Dan Lepard, rye crackers, rye crisp bread, Short & Sweet, sourdough rye on 02/01/2012 by Joanna. This entry was posted in Pastry, Short and Tweet, Supper Dishes and tagged baking, chilli pastry, Christmas, Dan Lepard, sausage rolls, Short and Sweet, Short and Tweet, treats on 18/12/2011 by Joanna. This week is the wholemeal bread challenge from Short & Sweet. You can find Felicity Cloake’s version of this recipe here on the Guardian website in which she explored different ways of approaching the wholemeal loaf and ended up liking Dan’s the best. I made two different loaves this time; Dan helpfully writes up the recipe saying it is a starting point to finding the loaf you are happy with. Once you have had a go at the basic one, you can move on to exciting variations like ale and spelt and unleash the creativity of your inner bread baker! I know you have one in you or you wouldn’t be reading this! I can eat 100% rye with great delight but something about too much wheat bran gives me indigestion. English stoneground wheat is always full of huge flakes of bran and I would rather have a finer milled German style whole wheat, though it seems almost impossible to buy here in the UK. Presumably any whole grain flour will give you dietary fibre, so you could use spelt, kamut, einkorn or emmer all possibilities for getting that fibre content into your daily bread. I went for a 50/50 blend of wholemeal and white in one of these loaves and of 50/50 kamut and white in the other. These breads don’t use milk, but they do use butter which improves the keeping qualities of the bread and is very traditional in English loaves. I used regular sugar in both as per the recipe and for my money that was a mistake as I have got used to using spraymalt to sweeten Brian’s white breads and I should have used that in these. The taste of regular sugar is too much for me in bread like this, though I imagine it is there to mask the slight bitterness of the wholemeal. I wonder if apple concentrate would be nice? It’s all about personal taste, so do vary recipes to suit your palate and experiment with sweeteners if you use them. Spraymalt is particularly nice, comes in lots of varieties, fascinating to read about it on the Muntons site. It is fairly easy to get hold of if you have a local brewing shop or from online beer making sites and I think Bakery Bits sells it too. The contrast in the doughs was quite marked. Dough 1 was sedate and quiet, whereas Dough 2 with the kamut was soft and bouncy and increased quickly in volume. Despite being a high protein flour, its gluten is very different from that of regular wheat and the surface of the dough pocketed and opened up quite a lot, giving a rugged rustic quality to the finished loaf. I couldn’t get it to form a smooth sheath at all on shaping. It also sprang dramatically in the oven unlike the wheat one which rose a bit but didn’t do anything very exciting. Both loaves make light sweet bread, easy for toast, very English in style. Not quite my thing but I am sure the sort of bread that pleases many people. it’s a very easy recipe for beginners to follow too, watch the timings, handle the dough gently, if you are not sure about shaping it use a tin which you butter and dust with flour and you’ll be fine. For a forthright discussion about the role of fibre in our diets and the ramifications for children’s health in particular read Lou’s post on Please Do Not Feed the Animals. For the round up post for last week’s sweetie extravaganza and some fascinating links click here and have a peek at the other round ups for the Shortandtweet group. Join in any time you feel like it, all welcome! 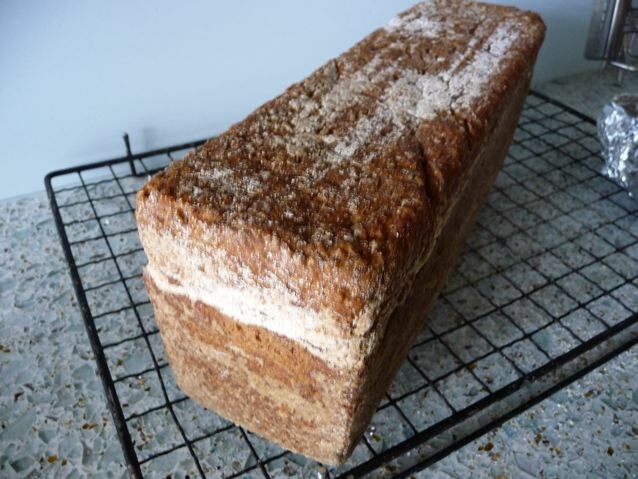 Just thought I’d add a few links to other bread posts which incorporate wholemeal flour but are very different from this one…. 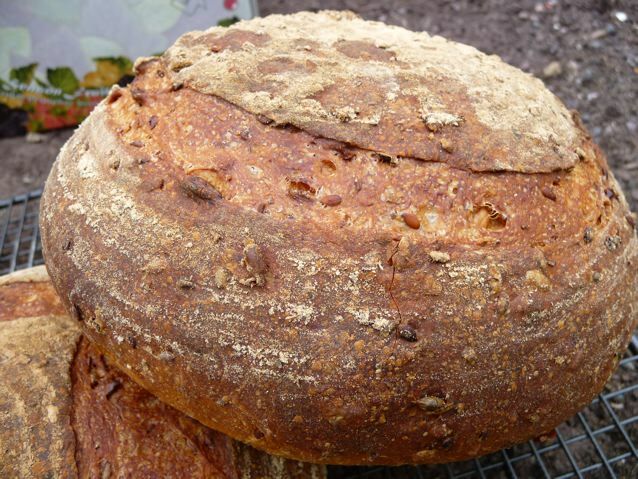 For a sourdough bread using mainly wholemeal have a look at this old post of mine from the Mellow Bakers project with the grand name of Miche Pointe-a-Calliere. Another very good bread is this Rustic Bread which uses a mix of flours, including wholemeal to produce a very pleasing loaf and in which I incorporated some left yoghurt whey. Another very popular bread that uses wholemeal flour is Dan Lepard’s Golspie Loaf, one of the star breads in the Hand Made Loaf. This is one I make regularly for my neighbour who is a big wholemeal fan. There is a picture of it in this little slideshow post. This entry was posted in Bread, Food, Short and Tweet and tagged baking, Dan Lepard, Food, Short & Sweet, Short and Tweet, wholemeal wheat bread on 02/12/2011 by Joanna.